Taking my arm now, He leads me to long way back through the castle. The freshness of the morning and the sparkle of the early morning dew makes the garden glimmer like a fairy tale—a very different place than it was just a month ago. I am shaken from my reverie as I realize He is leading me to the study. My heart leaps! I so love that place with Him. Walking in, I do not know what to expect. My hands are full and I do not know what to do with the objects I carry. 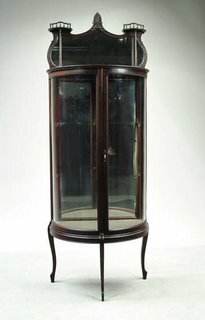 “Place them in the cabinet by the windows.” He instructs, gesturing toward the elegant curio cabinet. The large cabinet stands elegantly between the two bright windows. Glass on three sides and mirrored behind, it holds the faceted bottle of oil, placed there not so very long ago. I find myself smiling at the remembrance of it. He helps me to open the curved glass door. Carefully I place each object, save the ring which I wear, on the empty glass shelves of the cabinet. “Here they will be before you, reminding you constantly.” He explains. As He speaks I look at the shelves and see that they are far from being full. There is so much more they are able to contain. I am encouraged. “Come sit by Me.” He directs, seating Himself in a chair by the fireplace. Contentedly I sink into the deep wool of the dark sheepskin rug at His feet. I want to rest my head on His knee, but find I still cannot. Instead I sit very close, not quite touching Him, staring with Him into the fire. We sit quietly for a while, peaceful in the silence. Finally, He places a hand on my shoulder and draws me closer to lean on Him, inviting me to rest my head on His knee. Tears fill my eyes as I submit to His invitation. And it is now that I am resting on Him that He begins to speak and to teach me. He has answered a question which had, until now, remained unasked. I know there was a taste of this understanding in the first place of rebuke with Him, but it was not complete then. Now I see that only in submission to all of His word can true humility ever be found. And it is even more complicated that I knew before. I look up into the mirror as He directs but it is a long time before I can speak. The picture I see is almost too full for words. I see a bride, as I had see before. I cannot yet see her as myself, that is still a leap too far. She is beautiful though, dressed head to toe in stunning white, with rare jewels to match. Suddenly though, I see something more. I see a bride who has nothing to offer her groom, no name, no family, no dowry. But the groom loved this bride so dearly, so deeply He would not be deterred. He went to His Father and explained the problem. Out of love for the Son, the Father Himself dressed the bride in her bridal clothes. He provided for her a dowry of gold coins and gems so that she would not come to her groom empty handed. He placed a ring on her finger and adopted her into His own family, giving her His name, for the sake of His name. The Father provided all this so that all would see the glory of the bridge groom in the splendor of His bride. All for the bride who had nothing, all because of love. The picture leaves me speechless. I understand even more clearly now what He has done and the overwhelming depth of love He has for me. Still without words to say, I glance at Him. In His hand there is a flask, of oil, I think. Without a second thought, I obey. Soon He works the fragrant oil into the newly formed scars across my belly and over my back and shoulders, ending with my feet and hands. I am overwhelmed and overcome with His goodness. His kindness is too much for words to express. I fall to my knees at His feet, crying and wishing I had something to offer Him at this moment, to be at His feet, empty-handed again just seems wrong. “What have I given You?” I ask, perplexed. His words ease my distress. Finally, He helps me to my feet. I refasten my own robes. “Let’s return upstairs to finish unpacking,” He tells me. I take His arm and He leads me upstairs. On the way, it seems the halls and the foyer have become less dusty and more bright.